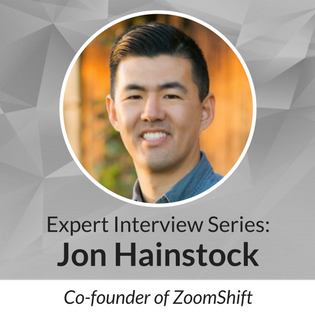 Jon Hainstock is the co-founder of ZoomShift, beautiful scheduling and time clock software designed for hourly employees. Can you tell us about the mission behind ZoomShift? The mission of ZoomShift is to simplify employee scheduling and time tracking for small businesses. How have you impacted the way business owners manage scheduling? We help managers spend less time scheduling by putting the schedule maker, staff availability, time offs, events, time tracking and discussions in one place. Instead of texting or calling employees to cover shifts, managers can get help with one click. Instead of tracking staff availability on paper, managers can view it as they build the schedule. Instead of printing out schedules, managers can publish and share shifts from anywhere. Employees get the benefit of being able to view their schedules anytime, pick up open shifts, add their availability and communicate with other employees without needing to share their personal contact information. Can you talk a little about your interest in entrepreneurship? How are you hoping to help entrepreneurs turn their ideas into businesses? The initial draw to building a business was the potential of a bigger payoff for the riskier up-front investment. As our business grows I’m finding more value in the freedom to be able to choose how I spend my day. This autonomy is priceless and has allowed me to spend more time with my family. I make myself available to aspiring entrepreneurs by offering stories from my journey to help them avoid mistakes I’ve made. Why should entrepreneurs be considering cloud-based infrastructure? What are the benefits? The benefits of a cloud-based infrastructure are that it’s cheap, scalable and easy to use. You don’t need to be extremely technical to get up and running. What business functions are best suited for the cloud? Anything that is being done in Excel or on paper is a candidate for businesses to transfer to the cloud. Hosting everything online gives you flexibility in how you display, modify and share data with your team. What are the benefits of using the cloud for scheduling and time clocks? How does the cloud improve older methods of time tracking? The benefits of moving to the cloud for scheduling and time clock are many. The top reason is the ability to view, edit and share things from anywhere at anytime. What are best practices for implementing any cloud-based software? What considerations should businesses make? When implementing any software I find a trial period is necessary. Get the organization involved at a level that doesn’t bog them down or decrease productivity. This may mean on boarding a few people at a time in order to work out the kinks before bringing on the whole team. How can organizations ensure the security of applications they move to the cloud? What are best practices? The best practice for security besides using https (SSL) is for each member of the organization to use a strong password. It can be beneficial for a business to implement something like LastPass with their employees before adopting cloud based technology. What trends or innovations in business infrastructure technology are you following today? Why do they excite you? I check Product Hunt daily for new and interesting tech. I gravitate toward products that include AI, bots and big data lately. But my heart really is set on cross-platform web applications. Get tech support for your small business.